O is for orlandocard. Orlandocard was (is?) an NSA operation that attracted visits from over 77,000 foreign computers and planted spyware on more than 1,000 by using a 'honeypot' computer. 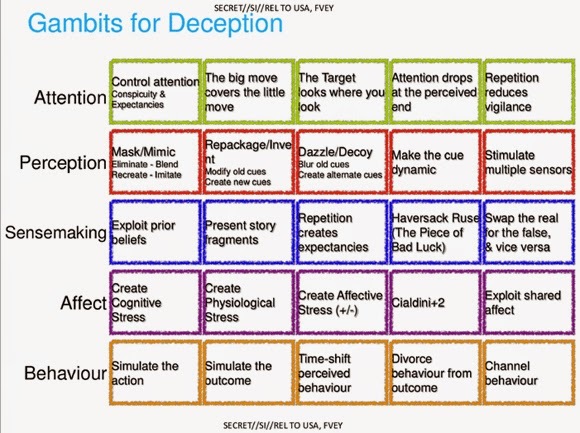 A 'honeypot' is pretty much what it sounds like -- a digital trap set to attract a certain target, much like a police officer might bait a criminal. A honeypot site seems to contain something of interest to its targets and it appears to be part of a network, but it is actually isolated and monitored. Another sort of 'honeypot' is the femme fatale, a character in every good spy story. She is usually a mysterious and seductive woman whose charms ensnare her lovers and lead them into compromising and dangerous situations. An early mythological form of femme fatale were the Greek sirens, who lured sailors with their enchanting music and voices to shipwreck on the rocky coast of their island. Mermaids are often associated with sirens. About 80 miles from the popular tourist destination city Orlando, Florida, before Sea World or Disney World, there was Weeki Wachee Springs, "the only city of live Mermaids!" Established in the 1940s, the Weeki Wachee mermaid shows reached their heyday in the 1960s. 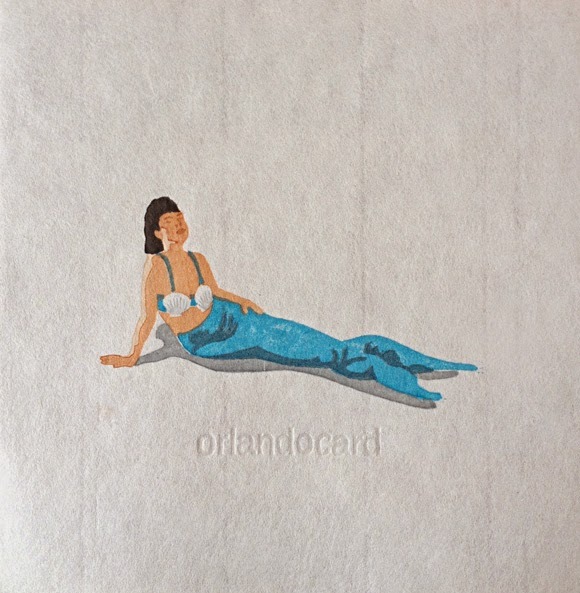 The Weeki Wachee / Orlando connection inspired me to depict the NSA Orlandocard Honeypot as a mermaid. N is for NECTAR. NECTAR is a designation applied to certain information (we don't know what kind of information) that marks it as being shareable with other countries. 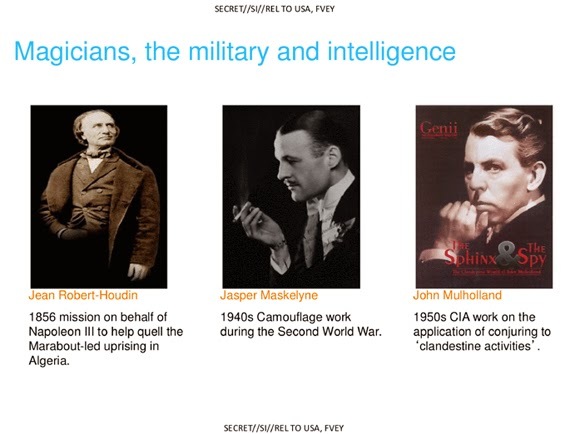 The NSA routinely shares information with the governments of our "second party" friends: Britain, Canada, Australia and New Zealand. But some information is shared more widely than that, with third and fourth party nations, which might include NATO countries or others. 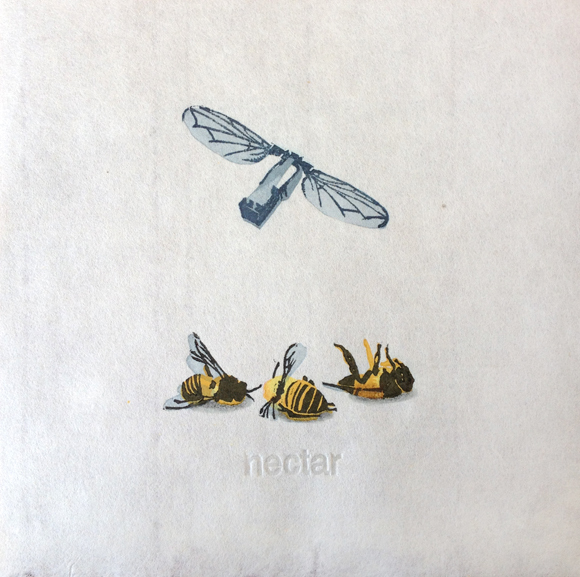 NECTAR is one of several designators that allows the data tagged with that name to be shared more widely. Just think, little bits of your very own personal information could be making their way anywhere in the world, like pollen scattered in the wind. Bees love nectar. And bees pollinate. And bees are dying. But here in America, we believe in the power of technology to cure our ills. Enter robobees. Robobees are being developed at Harvard School of Engineering and Applied Sciences, with funding from the National Science Foundation. They're pretty cool, and they can be used in all sorts of ways. It's possible that if we lost all our honeybees, robobees could save us from agricultural disaster by autonomously pollinating fields of crops. Or robobees could be used for search and rescue reconnaissance in dangerous situations. 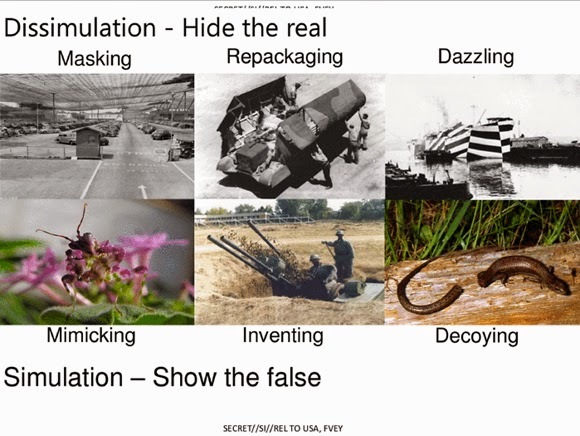 And, of course, robobees could be used for spying. Maybe they could even shoot little weapons, since they're basically tiny drones. That's the beauty of technology: you can use it all sorts of ways. Magic Lantern is a software developed by the FBI for logging and recording keystrokes on a computer. Keystroke logging has been used since the 1980s, and there are a number of different types (software, hardware, acoustic, etc.). 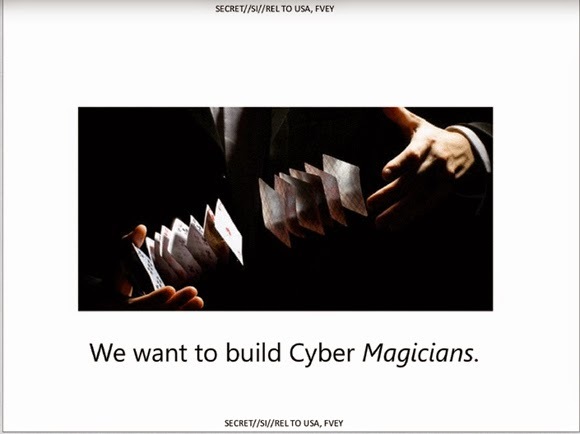 Magic Lantern, first reported in 2001, is a software-type keystroke recorder that is typically deployed in an email which installs a trojan horse on the target computer. Oh, where to begin. Let's start with the device called a magic lantern. 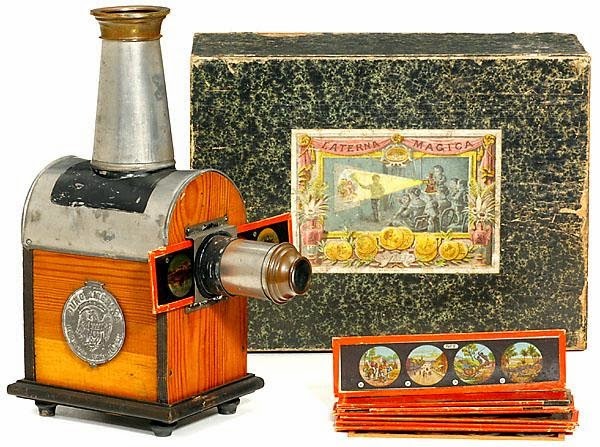 A precursor to the film projector, the magic lantern (laterna magica) was a simple projector that used a concave mirror behind a light source (a candle or oil lamp) to direct light through a rectangular glass slide on which was a painted or photographic image. The light then passed through a lens in front of the slide which added focus to the projection. 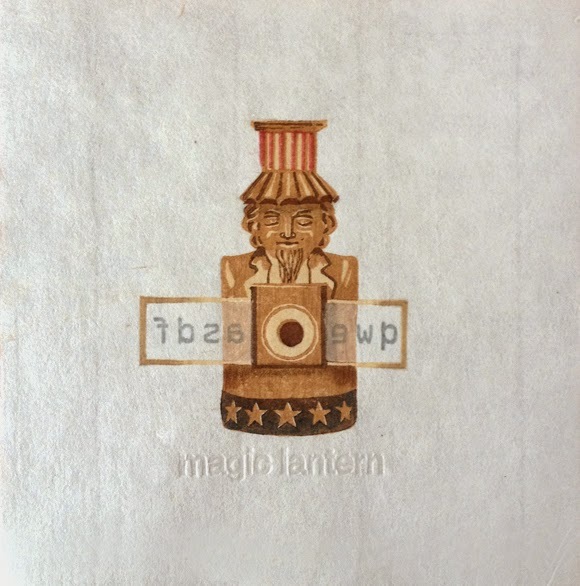 Although used as an entertainment device, the magic lantern was more often associated with magicians, conjurers, and mediums, who could use the device to project large and convincing images of ghosts and spirits onto smoke or thin gauze. 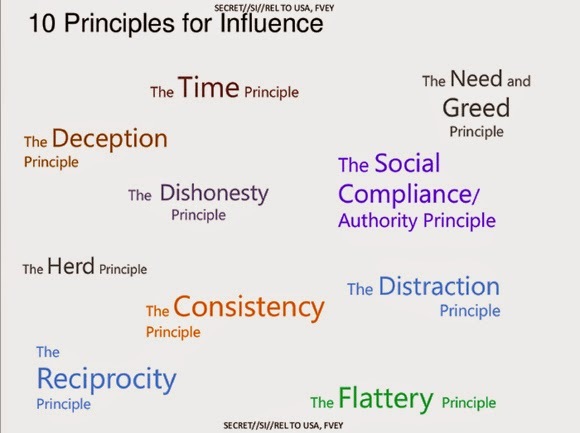 (These look a lot like Girl Scout badges, no?) 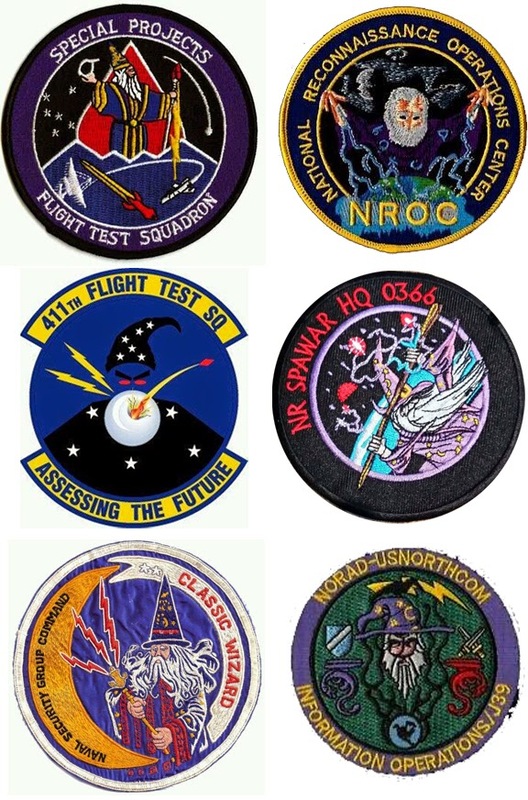 Personally, I like the Classic Wizard above. If I were a wizard I think I'd be a classic one. Creepy or what? 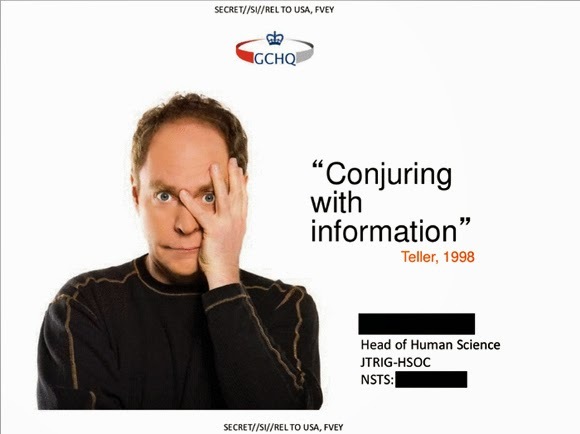 I really get why Teller is holding his face like that. To end on a lighter note, there's just one more tidbit of information that I came across while researching the magic lantern that I'd like to share with you, and which appeals to me very much as an artist. It seems that during the height of the magic lantern's popularity, the manufacture of lantern slides provided many aspiring artists with steady employment when sales of their own work were insufficient to keep bread on the table. The first day of the conference was focused around two sites, San Francisco State University and City College of San Francisco. I was excited to see a demonstration of flying printed kites at SFSU, having made a kite for the Mokuhanga Conference in Kyoto in 2011, but the event hadn't really gotten going yet when I was there and there wasn't much wind, so I continued on. 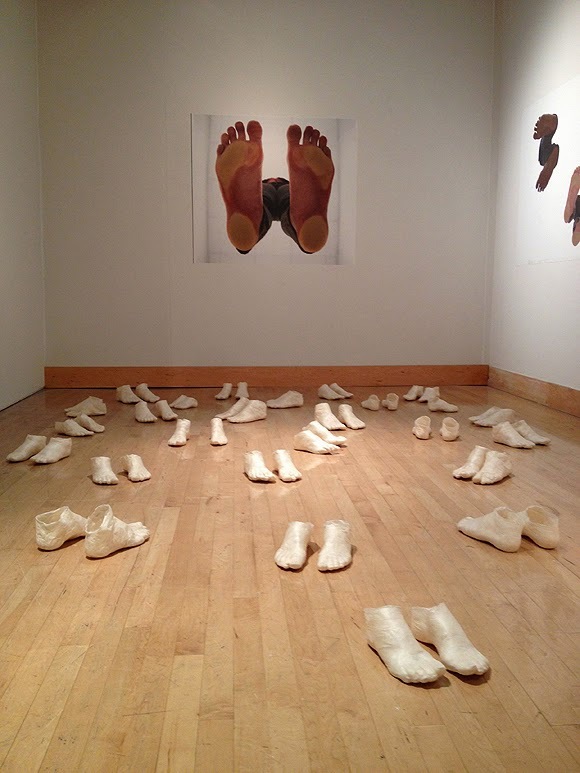 The exhibition I most loved at SFSU was one called Progressive Proof: Innovative Prints from the Pacific Rim, which featured dimensional work by nine women artists. 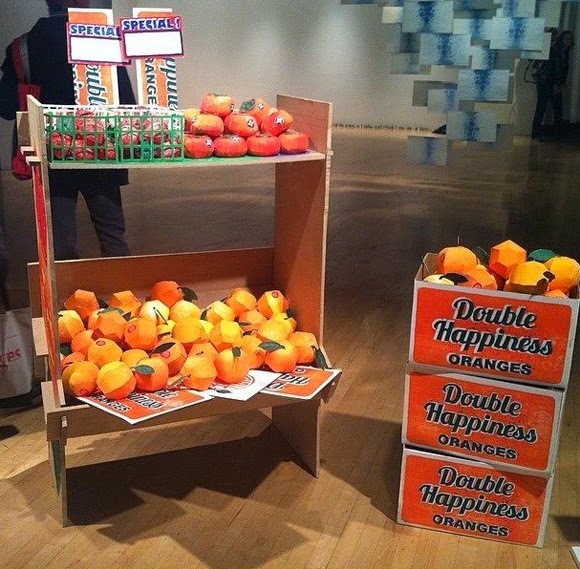 Here are some shots from that show. 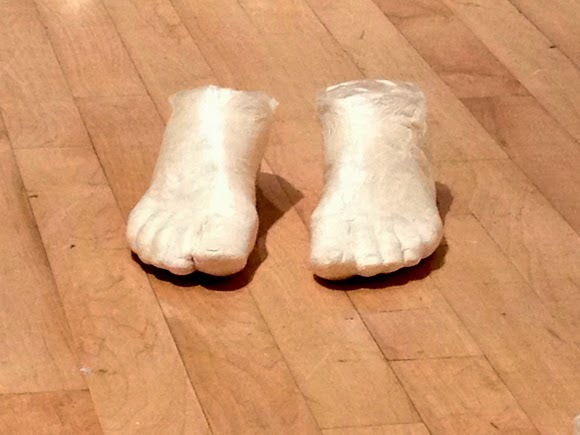 Weight of Being by Hyeyoung Shin, digital prints and Gampi paper feet casts. I love the sheen of the Gampi. 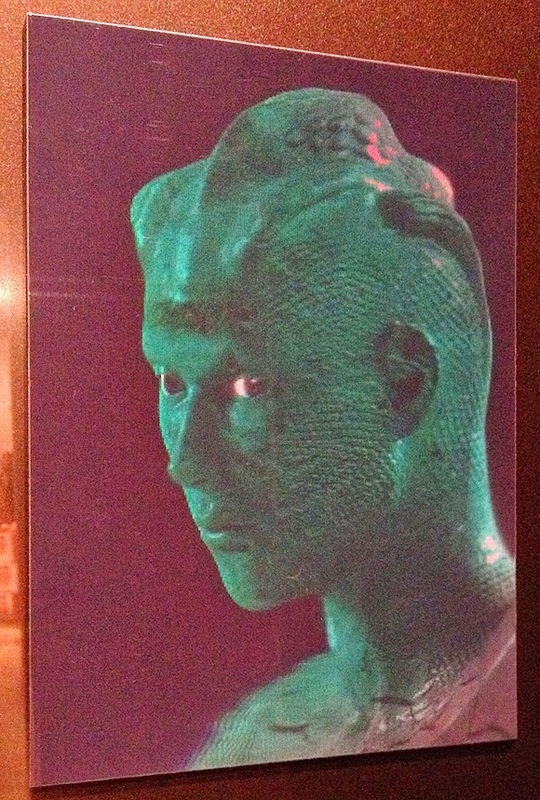 The human body as print matrix. 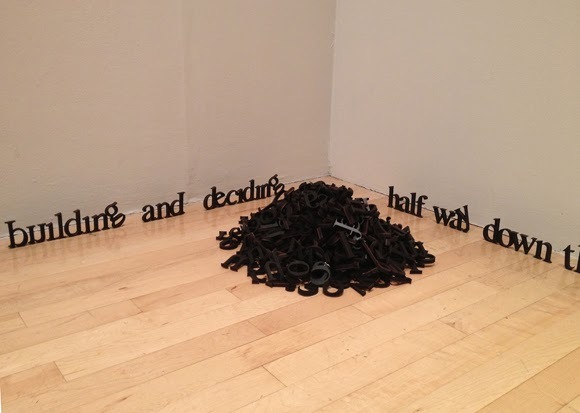 Feminist Essay by Emily Floyd, medium density fiberboard (mdf) letters. 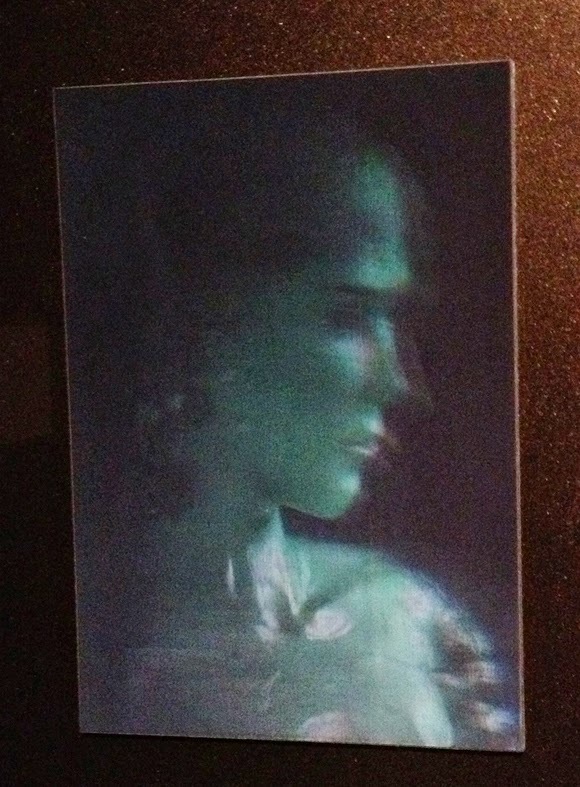 Portrait of Eve Clone by Pey Chwen Lin, hologram prints. 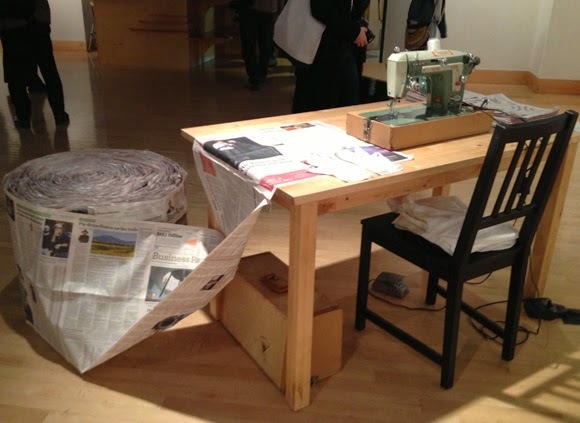 Making Everything Make Sense: A four-day print by Aimée Henny Brown, sewing machine, table, chair, bell, scissors, San Francisco Chronicle Newspaper from Jan 13 - Feb 13, 2014, thread, dress, sweater, shoes. 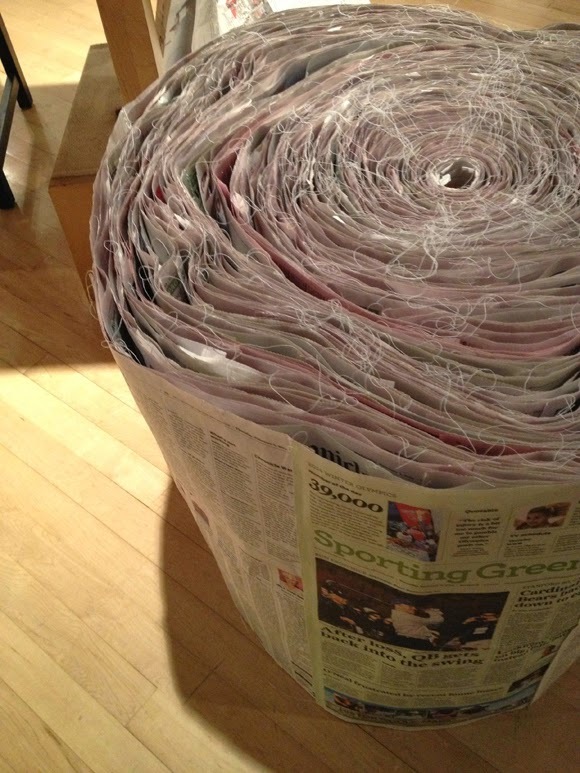 I've been waiting for some time to make a big long post about "Bridges," the SGCI Printmaking Conference that happened at the end of March in San Francisco, but it's become clear to me that no such time exists, so I'm going to do some short piecemeal posts. 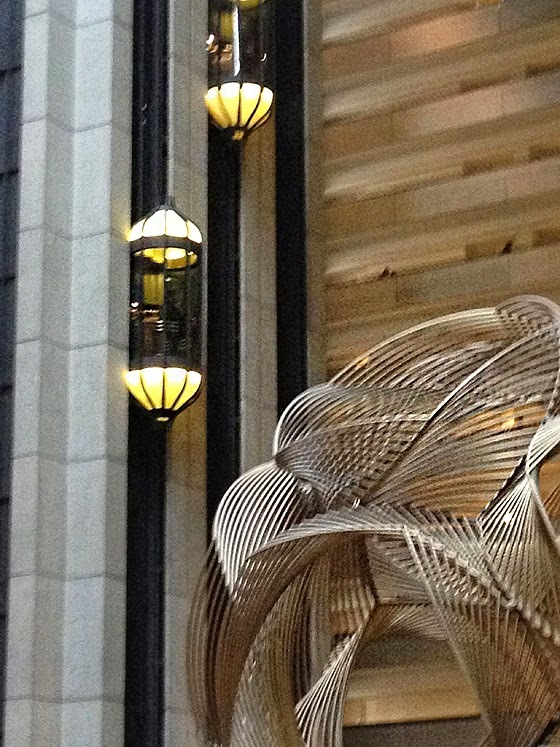 The conference hotel was the Hyatt Regency, Embarcadero, and it's such a distinctive building that I'm going to give the hotel its own post. I roomed there as well, and enjoyed the amenities a lot (though my credit card bill still hasn't arrived). 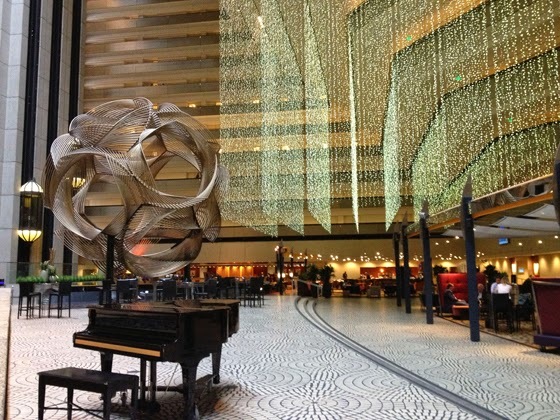 The hotel lobby is like a movie set, which isn't surprising because the architect, John Portman, has said that the design was influenced by the 1935 science fiction film Things to Come. Also not surprising for the same reason is that the lobby has been used to shoot other films, most notably Towering Inferno and High Anxiety. Some people reported high anxiety around the speedy glass elevators, but I loved those elevators and rode up and down to my room on the 14th floor as often as possible. 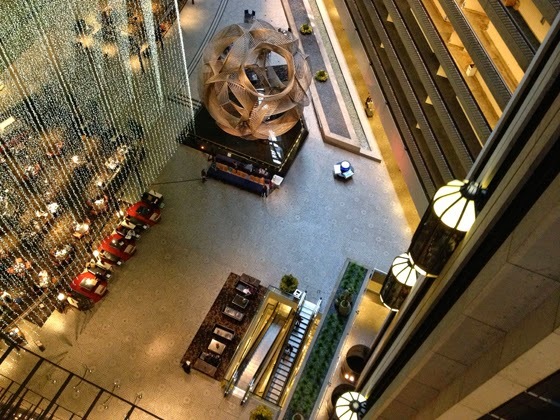 Above is a view of the lobby from the 14th floor. 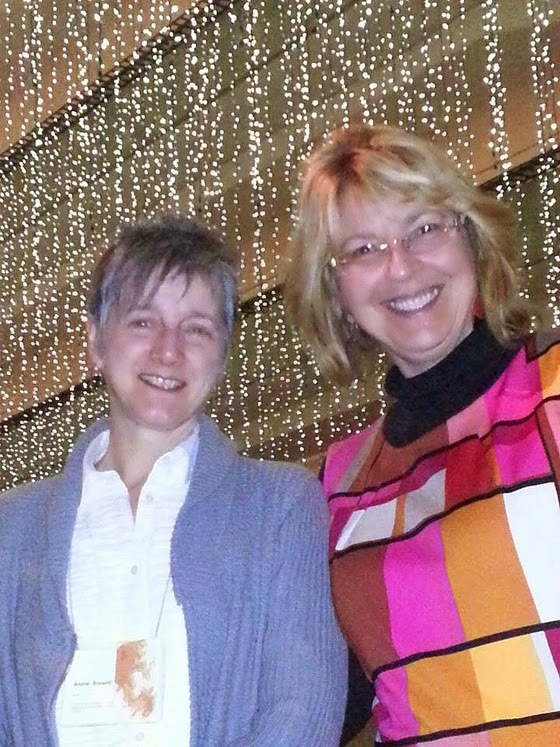 I was delighted to meet up with my college roommate Mary on my first evening in San Francisco. We hadn't seen each other for over 30 years. At the time this photo was taken, I had been awake for about 21 hours. Kind of like being drunk, but without the alcohol. It was fun. I'll show you some actual art in the next post.